I am busy filling a dessert order today, so I knew I needed a Sunday menu that would take it easy on me, but still be delicious. The appetizer and dessert can be prepared the day before. While the chicken roasts, I can cook the rice and simmer the peas. Once the chicken is done and resting, I will finish the sauce. As with all of our Sunday Dinners, I like to feature one recipe. 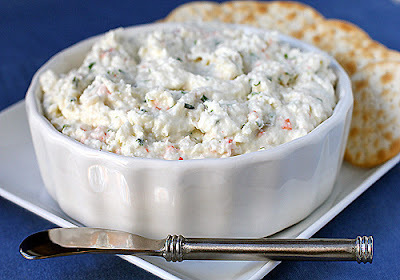 Since it is already prepared, I am sharing the Shrimp and Sherry Cheese Spread today. If you look back on Sunday Dinner menus past, you will notice that this appetizer is one we enjoy. I created this a few years ago looking to use up some things in the refrigerator and freezer. It is simple to prepare and so tasty. I use poached shrimp, cream cheese, lemon juice, chives, shallots, and a wee bit of sherry. It is the sherry that really makes this dish. It really rounds out all the flavors and brightens the shrimp. With a dash of Tabasco to spice it up, you will have a hard time staying away from this. Bring 4 cups of water, salt, and lemon slice to a boil in a medium saucepan. Reduce the heat to medium and add the shrimp. Cook until the shrimp have just turned pink, about 3-5 minutes. Using a slotted spoon, remove the shrimp, place them in a bowl, and cover with plastic wrap. Set aside until cool enough to peel. In the bowl of a food processor, add the cooled and peeled shrimp. Using several 1-second pulses, process the shrimp to break into smaller pieces. Add the cream cheese, lemon juice, Sherry, chives, and shallots. Process until a smooth paste has formed. Transfer the mixture to a serving bowl and cover with plastic wrap. Chill for at least 1 hour before serving. Spread can be made up to 3 days in advance and stored in an airtight container in the refrigerator. Remove from the refrigerator at least 30 minutes before serving. Enjoy! This looks delicious! Where can I find the recipes for the other items on the menu? Thank you. Right now I only feature one recipe from my Sunday Dinner menu, but all the recipes will be posted in the future:) Thank you for stopping by! This sounds wonderful! I like crab dips but haven't tried a shrimp dip yet, and the addition of sherry sounds really intriguing. I'll have to give this a try. LOVE the blog! I don't have any sherry, can I replace it with anything else? I have red and white wine and vinegars...or should I just forget about it? Thanks! If you don't have sherry just omit it. There is already acidity from the lemon juice so adding another acid in the for of a vinegar won't work. The sherry adds a touch of sweetness, but if you don't have it, it will still be good. So glad you like my blog! Best!